UCF won its 20th straight game on Saturday, beating East Carolina 37-10 on the road. The Knights (7-0, 4-0 AAC) are still No. 10 in the AP Poll entering their bye week. They return to Spectrum Stadium on Nov. 1 to host Temple, but before we get there, let’s check on what else went down around the AAC in week eight. What does this all mean for UCF? The top of the AAC East saw a bit of a shakeup this weekend, with Cincinnati falling to Temple in overtime. In recent weeks, the focus has been on UCF, South Florida and Cincinnati. Temple was there too with an undefeated conference record, but still felt like the fourth-most likely team to win the division. That changed this weekend with the Owls’ comeback win over the Bearcats. All hope isn’t lost for Cincinnati, but its road to the AAC Championship Game just got a lot tougher. With the season nearing its final stretch, the race for the AAC East title is going to heat up. The Bulls head to Houston this week for what is their first tough conference game of the season. With as shaky as South Florida looked against UConn (and Tulsa last week), the final stretch will be extremely telling for Charlie Strong and his team. After facing Houston, the Bulls still have meetings with Temple, Cincinnati and, of course, UCF. Whether they are still in the conversation for the conference championship game by that Black Friday matchup with the Knights is a legitimate question right now. The Owls are off this week before their trip to Orlando next Thursday. That Nov. 1 matchup for the Knights will be crucial, considering that both teams will enter with undefeated records in AAC play. Temple has been hot and cold at different times this year, but it has a fighting chance to play for the conference crown in December. While the AAC East is basically decided with a round-robin tournament in November, the AAC West is more of a two-team race. Houston is 100 percent the favorite to win that division. SMU is pretty much the only team left that could still challenge for it, but the Cougars are the better team. Memphis, Tulsa and Navy might not be mathematically eliminated, but they’re not coming back from the depths of the division this year. The four-team race in the AAC East, in all likelihood, is for a date with Houston on Dec. 1. 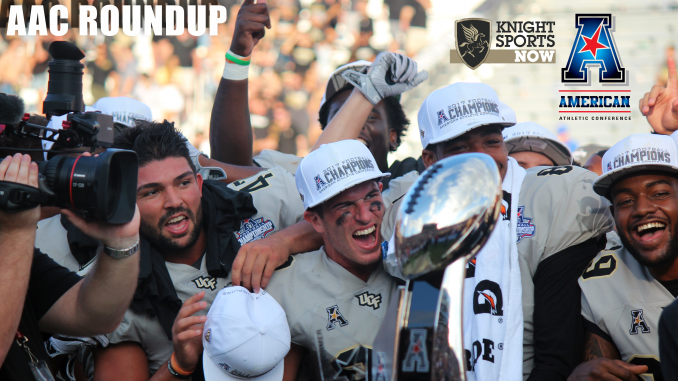 Bailey Adams is a senior writer covering UCF Football and Baseball for Knight Sports Now. You can follow him on Twitter at @BaileyJAdams22.